That view over London is from the top of One Tree Hill, in Honor Oak - part of a string of wooded hills stretching from Croydon to Southwark that were once part of the Great North Wood. 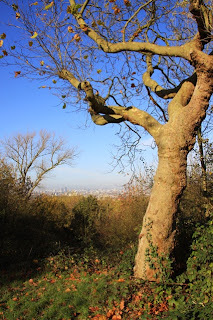 I'm posting these photos now because today is Remembrance Day - the anniversary of the end of the First World War - and One Tree Hill played an important part in the protection of the capital from raids by by Zeppelin airships during the Great War. One Tree Hill is one of the highest spots in the area and so was in an ideal position for a gun emplacement. 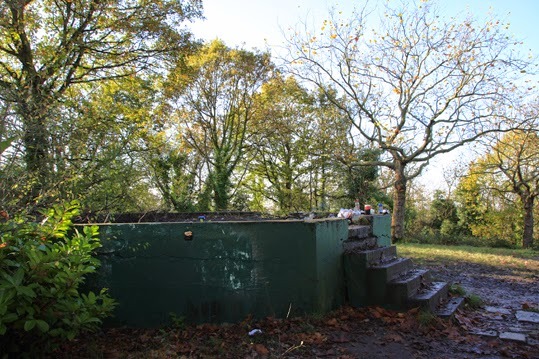 The solid concrete platform that served as the base for the gun is still at the hill's summit although, to be honest, it is usually in a bit of a sorry state as it is a popular place for unofficial late-night parties. When I visited on the morning of Remembrance Sunday last weekend there were the remains of a still-smoking bonfire on top of it and piles of empty bottles and cans - as you can see in the photo below. I really can understand that the top of one-tree hill would be a wonderful site for a party, but I really do wish that those who did so took their rubbish away with them. Mind you, modern-day revellers are not the first to have partied on One Tree Hill. The name originates from the Oak of Honor Hill. Apparently on 1 May 1602, Elizabeth I picnicked with Sir Richard Bulkeley of Beaumaris by an oak tree at the hill's summit. A legend goes that Good Queen Bess got so tiddly that she decided to knight the tree, which became known as the Oak of Honor. The story probably isn't true, but never mind. The tree in the photo to the right is not the Oak of Honor - I don't think it is even an oak tree. There is still a oak nearby, surrounded by railings. It was planted in 1905 as a successor to the historic great tree. One Tree Hill is a beautiful spot to visit, as I hope you can see. Next time I go there, however, I think I will bring a bin sack and do my bit to clear up the rubbish that others have left on the site. Lovely post, lovely site! Thanks for this Lucya. The photo looking into London is fab.